To serve at Mass is a practical way to show our love for Jesus. It helps everyone at Mass to join in praise of God. It is a way of being like Jesus who said: "I came not to be served but to serve". There is no upper age limit for servers and we welcome interest from adults as well as children. 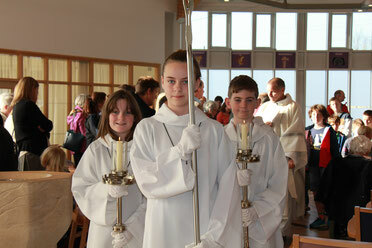 Servers make a big difference to how the Mass is celebrated. They help to make the celebration run smoothly and to look impressive. Carrying the cross and candles always show that something important is taking place and help draw our attention to what is going on. Holding the book allows the priest to lift his hands in prayer. Assisting with the preparation of the altar shows that we are reaching the heart of the Mass and this is highlighted too by the ringing of the bell at significant moments in the Eucharistic Prayer. You can speak with Fr Peter, Deacon John, Sister Catherine or Tony Kearney. If you join the team you will be shown how to prepare before Mass by arriving in good time, putting on the white alb and being ready for the start of Mass. The different responsibilities are not learnt all at once but bit by bit as your confidence grows. Help me, Jesus, to serve with love. To serve as well as I can. And to trust in you always. Help me to listen to the words that are spoken at Mass and to make them my own. May all my actions and the way I do them be respectful. And may my eyes help me to see what needs to be done at each moment. Amen.